Looking to improve the thinning or balding areas of your scalp? If so, a hair transplant may be right for you. A hair transplant is a procedure in which healthy hair follicles are harvested from one area of the scalp and transplanted to fill in areas suffering from hair loss. Since the transplanted hairs are healthy, they retain their genetic resistance to the effects of dihydrotestosterone, an active form of testosterone in the body’s tissues. This means that once the hairs are transplanted, they’ll continue to grow and won’t ever again be impacted by hair loss. Hair transplantation surgery is proven to be effective, producing highly successful results. On average, the success rate of the transplanted follicular units, or grafts, are very high at about 99%. However, in order to reap these positive results, one must first understand the pros and cons to hair transplants. For example, the treatment is a surgical procedure that requires a period of recovery. To become further acquainted with hair transplantation surgery, read on to first learn about the various pros and cons of this procedure, and second, discover whether you’re a candidate for a transplant. Hair transplantation surgery is a highly sophisticated surgical procedure that guarantees the growth of healthy hair in otherwise bald or thinning areas. 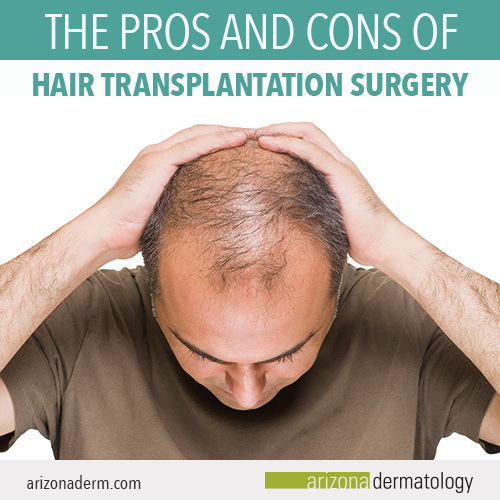 At Arizona Dermatology, we use the most revolutionary type of hair transplantation called Follicular Unit Transplantation, or FUT. This type of procedure is done by transplanting your natural hair in groups of one to four follicles, which we refer to as follicular units. Harvesting hairs in follicular units eases the transplantation process, improves the appearance of your finalized results, and increases the probability of a successful transplantation. Using the latest advancements in technology, you can have hair that lasts a lifetime. Once your session(s) are complete, you’ll never lose your transplanted hair again. One potential con to hair transplantation surgery is the fact it’s a surgical procedure, which tends to frighten some of our patients. However, at Arizona Dermatology, we acknowledge and understand why you may feel uneasy. With that in mind, we do everything we can to make sure you’re relaxed, comfortable, and well taken care of before, during, and after surgery. For example, on the day of your procedure, we’ll offer a very light sedative to help calm your nerves. We also have multiple ways to help you keep your mind off the surgery itself. From listening to music to watching movies, there’s plenty of things we can do to keep you occupied. In addition, our staff is always there to help. We’ve been preforming this procedure for decades and are always happy, cheerful, and talkative, which you’ll notice helps the time go by very quickly. The results of hair transplantation surgery are always aimed at looking natural and subtle. 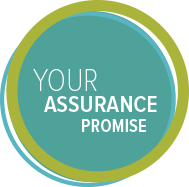 Our doctors at Arizona Dermatology are committed to this promise. The natural and subtle results of hair transplants are obtained through highly developed techniques and years of experience. Our surgeons determine the most effective angle, location, and distribution of the transplanted hairs. When this is executed properly, the results are miraculous. The transplanted hairs blend seamlessly into your other healthy hairs, forming a completely natural look. No one will know about your hair transplant but you. Hair transplantation surgery is a serious procedure and should be treated as such. When you don’t treat your recovery time seriously, you increase risks of infection, bleeding, scarring, and numbness. However, by following our recommended tips during your recovery time, you should be able to avoid these potential complications and return to everyday activities anywhere from 10 days to three weeks. Tugging and pulling: Give your scalp time to heal. Avoid itching, pulling, scratching, or anything else that could potentially irritate donor or transplanted areas. Direct sunlight: We recommend wearing a hat to protect your scalp from sunlight for at least three weeks after surgery. Usual sleeping conditions: Sleep with your head and neck elevated to avoid any disruption to the healing process of your hair follicles. These are just a few of the general tips that we provide each hair transplant patient. However, after your hair transplantation surgery, our surgeons will provide more detailed and specified instructions, tailored to your recovery time. One of the most exciting parts of hair transplants is that after the procedure, the hair is completely functional and completely yours. After your recovery time has passed, the transplanted hair doesn’t require any specialized treatment. Meaning, you can cut, brush, style, color, and use any kind of shampoo, conditioner, or hair product. This is a large benefit as you can treat your transplanted hairs just like any other hair on your head—for the rest of your life. Am I a candidate for hair transplantation surgery? Male or female: Contrary to popular belief, hair transplants aren’t solely for men. Both men and women can reap successful results from hair transplantation surgery. Over the age of 25: Hair transplants are most effective later in life when the majority or all of your hair loss has already occurred. Suffer from male or female pattern baldness: With male pattern baldness, hair loss occurs on the top and front of the head. As for female pattern baldness, hair loss often begins at the part. Both circumstances leave some areas on the scalp unaffected, providing a perfect area to harvest healthy hairs for transplantation. Realistic expectations: Hair transplantation is the only hair restoration treatment in which we can guarantee healthy hair growth. However, it’s important to have realistic expectations. For example, your newly transplanted hairs will have the similar texture and shape as your current, unaffected hairs. If I’m not a candidate: What should I do? If you find that you don’t fit the mold of an ideal hair transplantation candidate—don’t worry. If you’re in this situation, we recommend scheduling a consultation appointment. Sometimes, even if you don’t feel like you meet the criteria, our top doctors may conclude otherwise. We also suggest taking a look at other various hair restoration treatments. With a wide variety of hair restoration treatments, we promise to work together until we find a treatment that fits your unique needs. If you have any questions, concerns, or comments about the various pros and cons of hair transplantation surgery, we encourage you to give us a call or set up a consultation appointment. At Arizona Dermatology, we’re dedicated to helping you feel confident in your skin—whether that involves a hair restoration surgery or any other cosmetic or medical treatment.